People living near abandoned homes say they've become an issue with squaters and criminal activity. INDIANAPOLIS -- Indianapolis Mayor Joe Hogsett promised to transform or teardown 2,000 houses around the city. Some of that has been done. But on Indy's north side, neighbors say people are throwing parties in an abandoned house near where kids wait for a school bus. Garen Robie said the house next door has been causing problems. "There have been people coming and going at all hours of the night," Robie said. "Usually in the morning, there are a bunch of alcohol and beer bottles strewn across the front of the yard." Robie has a young child in the house, making the problems even more concerning. 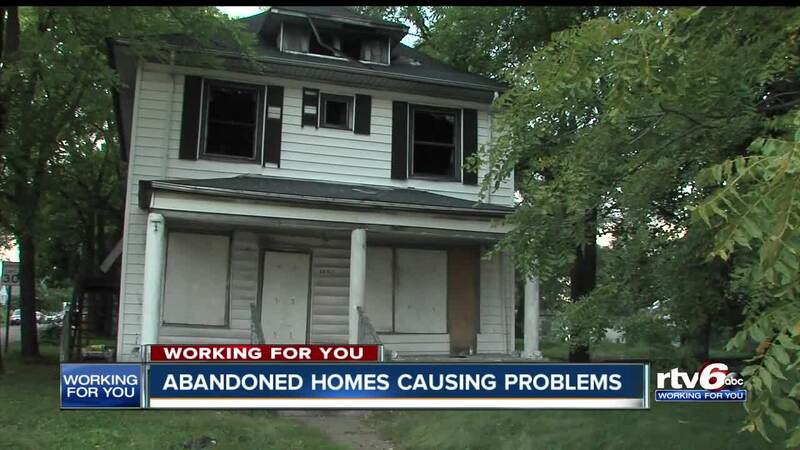 Hogsett's initiative intends to fix or bulldoze abandoned properties. There are three ways homes are identified as "abandoned." There also must be no orders from the Marion County Health Department. On Indianapolis' south side, Kadem Elliot is concerned about a home that sits behind his daughter's bus stop at the intersection of Parker and English avenues. "All we see is homeless, alcoholic, drugs -- everybody sitting at this house," Elliot said. Trash and alcohol bottles were seen around the property. Elliot's daughter goes to Emma Donna Elementary, an IPS Innovation school. The school's transportation is managed by A&S Transportation in Florida. A&S has not responded to questions about moving the bus stop.